The Washington Nationals visit Citi Field on Friday, September 22, 2017 to play the New York Mets. The probable starters are Edwin Jackson for the Nationals and Jacob deGrom for the Mets. The opening line for this matchup has Washington at +138 and New York at -148. The Nationals have a 66-75-10 over/under record and a 75-76-0 run line mark. The Mets are 67-85-0 against the run line and have a 86-54-12 over/under record. The Nationals have a 92-59 overall record this season. Starting pitcher Edwin Jackson has a 5-6 record with an earned run average of 4.96 and a WHIP of 1.52. He has 49 strikeouts over his 65.1 innings pitched and he's given up 74 hits. He allows 10.2 hits per 9 innings and he has a FIP of 6.39. The bullpen has an earned run average of 4.47 and they have given up 433 base hits on the year. Teams are hitting .254 against the bullpen and they've struck out 407 hitters and walked 148 batters. As a team, Washington allows 8.1 hits per nine innings while striking out 9 batters per nine innings. They are 6th in the league in team earned run average at 3.85. The Nationals pitchers collectively have given up 1,216 base hits and 578 earned runs. They have allowed 184 home runs this season, ranking them 15th in the league. Washington as a pitching staff has walked 454 batters and struck out 1,355. They have walked 3 men per 9 innings while striking out 9 per 9. They have a team WHIP of 1.24 and their FIP as a unit is 4.05. As a team Washington is hitting .268, good for 3rd in the league. The Nationals hold a .451 team slugging percentage and an on-base percentage of .333, which is good for 9th in baseball. They rank 3rd in MLB with 9.2 hits per game. Anthony Rendon is hitting .303 with an on-base percentage of .402. He has 146 hits this season in 482 at bats with 96 runs batted in. He has a slugging percentage of .537 and an OPS+ of 141. Daniel Murphy is hitting .317 this year and he has an on-base percentage of .379. He has totaled 160 hits and he has driven in 89 men in 504 at bats. His OPS+ is 134 while his slugging percentage is at .538. The Nationals have 1,386 base hits, including 295 doubles and 201 homers. Washington has walked 503 times so far this year and they have struck out 1,220 times as a team. They have left 1,020 runners on base and have a team OPS of .784. They tally 5.13 runs per contest and have totaled 775 runs this year. New York has a 65-87 overall mark this year. With an earned run average of 3.55, Jacob deGrom has a 15-9 record and a 1.20 WHIP. He has 228 strikeouts over the 195.1 innings he's pitched. He's also given up 175 hits. He allows 8.1 hits per nine innings and his FIP stands at 3.56. The bullpen has an earned run average of 4.84 and they have given up 534 base hits on the year. Teams are hitting .258 against the Mets bullpen. Their relievers have struck out 553 batters and walked 246 opposing hitters. As a team, New York allows 9.7 hits per nine innings while striking out 8.7 batters per nine innings. They are 28th in the league in team earned run average at 5.05. The Mets pitchers as a team have surrendered 1,453 base knocks and 754 earned runs this season. They have given up 207 home runs this year, which ranks 10th in Major League Baseball. New York as a staff has walked 557 hitters and struck out 1,293 batters. They give up a walk 3.7 times per 9 innings while they strike out 8.7 per 9. Their team WHIP is 1.50 while their FIP as a staff is 4.59. As a team, they are batting .251, good for 19th in the league. The Mets hold a .438 team slugging percentage and an on-base percentage of .320, which is good for 20th in baseball. They rank 20th in MLB with 8.5 hits per contest. Jay Bruce comes into this matchup batting .257 with an OBP of .325. He has 134 hits this year along with 95 RBI in 522 AB's. He maintains a slugging percentage of .513 with an OPS+ of 117. Asdrubal Cabrera is hitting .276 this season and he has an OBP of .347. He has collected 124 hits in 450 at bats while driving in 52 runs. He has an OPS+ of 105 and a slugging percentage of .431. The Mets as a team have 1,299 base knocks, including 271 doubles and 215 home runs. New York has walked 490 times this season and they have struck out 1,207 times. They have had 1,023 runners left on base and have an OPS of .758. They have scored 4.59 runs per contest and totaled 698 runs this season. 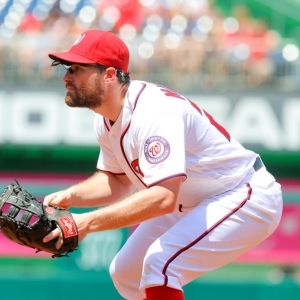 Who will win tonight's Nationals/Mets MLB game against the spread?